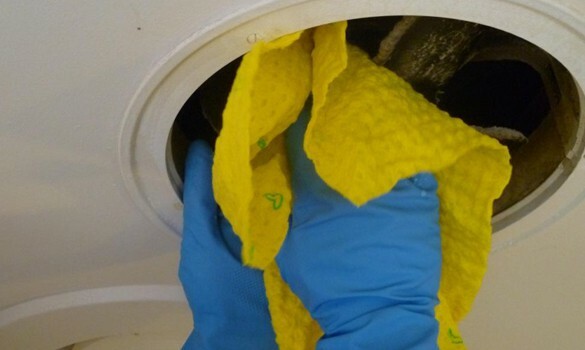 Cleaning bathroom exhaust fans regularly is important for proper ventilation, odor and humidity control. Bathroom exhaust cleaning keeps the vent, motor and fan from clogging, enabling full air flow and preventing moisture and condensation buildup that is a breeding ground for mold. When a bathroom doesn’t have a window, you should regularly run the exhaust fan, which is vented to the outside, to extract moisture from the room. Bathroom vent cleaning keeps the bathroom exhaust in good working order and extends the lifespan of the fan. Neglecting to have the bathroom exhaust cleaned can lead to poor air quality, odors that create a highly unpleasant experience for your customers and employees, and the potential need for mold removal and remediation. Action Duct’s bathroom exhaust cleaning service typically takes only about an hour per bathroom, and we can schedule it around what works best for your business.